The time is flying! 2016 has become history. Looking back on the past year, our R & D team continues to grow. 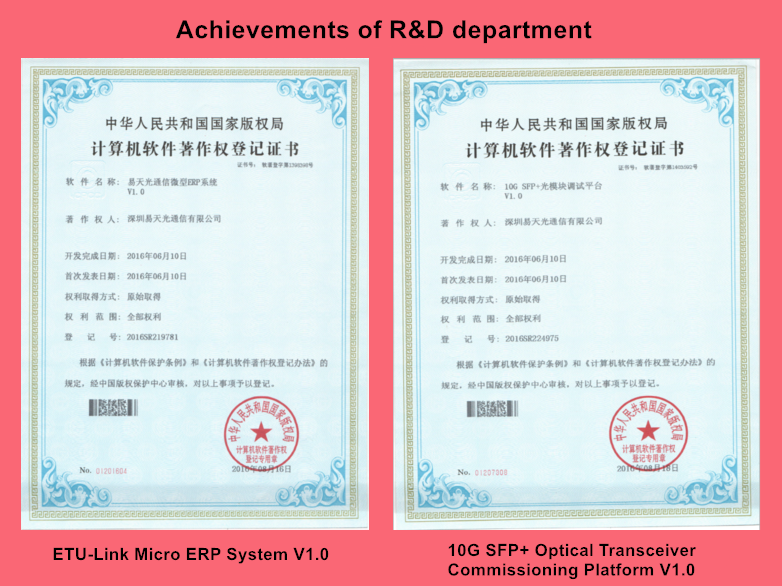 In the previous article, we mentioned that our company has made some R & D achievements in the first half: TOSA test system V1.0, ROSA test system V1.0 and Optical transceiver commissioning platform V1.0. In the second half, they did not slow down, dedicated to the research and innovation. 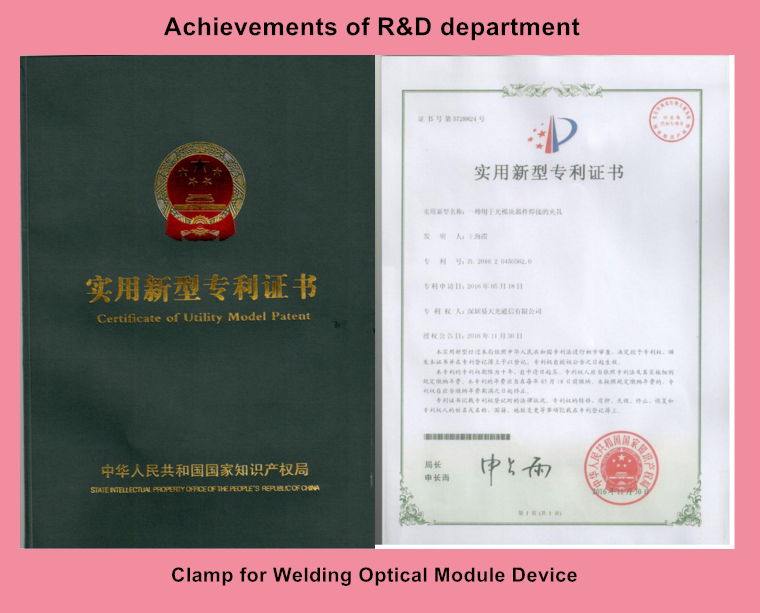 In the tireless efforts of R & D team, achievements of research and development, got the following two software copyrights and two utility model patents. In addition to the above patents, our company still have two software copyrights were under review. In addition to the achievements in software patents and copyrights, they have made a lot of contributions in the production of software programs, such as micro ERP system and write code program. 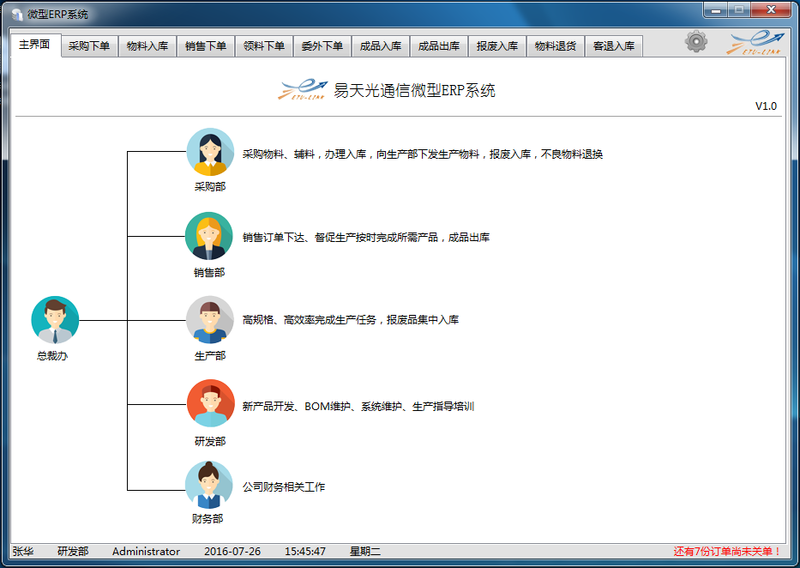 ERP version continues to upgrade on-demand, the current version supports the automatic selection of optical modules SN, contract for sales orders, increase the high resolution version and more advanced features. The ERP system provides a great convenience for us to make order and contract. The new code program is divided into external and internal versions, external version can be sold packaged with write code board, pursue as stable as possible. Can also be upgraded according to customer demands, English interface to adapt to various customer. Internal version is Chinese, more powerful, supporting batch write code, code analysis, DDM and read and write the threshold, code generation and other more functions. 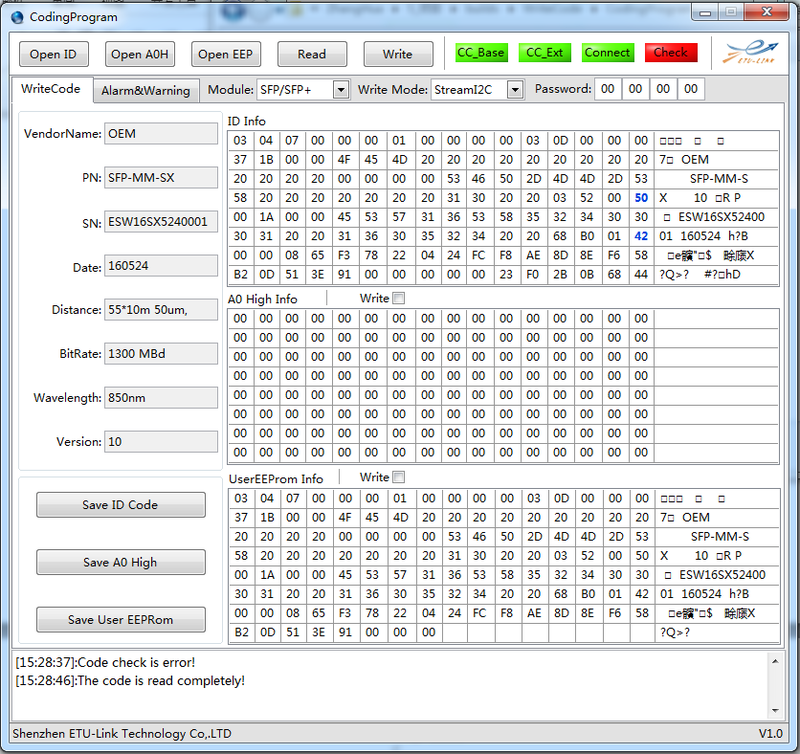 Subsequent upgrades version will analysis coding of different manufacturers, providing a more comprehensive coding function. As an R & D innovation enterprise, patent acquisition may not fully represent the company's R & D level, but provide a reference at least. At the same time, it can also explain the company's team for the honor of yearning. Our company is also moving towards higher and stronger, get more people’s recognition. 2017 has begun, it’s a crucial year for us. 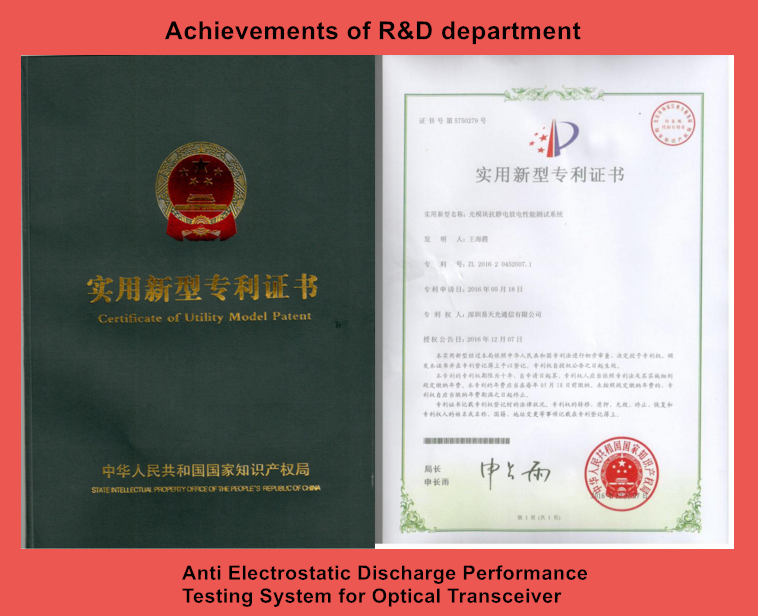 We are full of confidence in the R & D team, we believe that they will get more patents and copyrights, achieve greater success in developing new projects. Let us look forward to a more brilliant ETU-Link! If you are interested, please pay attention to our blog, WeChat public number (ETU-LINK), we are willing to share you with more knowledge and the development of our company!